Inherited by AbiTagAttr, ArraySubscriptExpr, ArrayType, BinaryExpr, BoolExpr, BracedExpr, BracedRangeExpr, CallExpr, CastExpr, ClosureTypeName, ConditionalExpr, ConversionExpr, ConversionOperatorType, CtorDtorName, CtorVtableSpecialName, DeleteExpr, DotSuffix, DtorName, DynamicExceptionSpec, ElaboratedTypeSpefType, EnableIfAttr, EnclosingExpr, ExpandedSpecialSubstitution, FloatLiteralImpl< Float >, FoldExpr, ForwardTemplateReference, FunctionEncoding, FunctionParam, FunctionType, GlobalQualifiedName, InitListExpr, IntegerCastExpr, IntegerLiteral, LiteralOperator, LocalName, MemberExpr, NameType, NameWithTemplateArgs, NestedName, NewExpr, NodeArrayNode, NoexceptSpec, ObjCProtoName, ParameterPack, ParameterPackExpansion, PixelVectorType, PointerToMemberType, PointerType, PostfixExpr, PostfixQualifiedType, PrefixExpr, QualifiedName, QualType, ReferenceType, SizeofParamPackExpr, SpecialName, SpecialSubstitution, StdQualifiedName, StructuredBindingName, TemplateArgs, TemplateArgumentPack, ThrowExpr, UnnamedTypeName, VectorType, and VendorExtQualType. Definition at line 105 of file ItaniumDemangle.h. 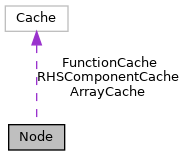 Unknown is possible if this node has an unexpanded parameter pack below it that may affect this cache. Definition at line 115 of file ItaniumDemangle.h. Definition at line 107 of file ItaniumDemangle.h. Definition at line 135 of file ItaniumDemangle.h. Referenced by llvm::SDValue::dump(), and getBaseName(). Reimplemented in SpecialSubstitution, ExpandedSpecialSubstitution, StdQualifiedName, GlobalQualifiedName, NameWithTemplateArgs, QualifiedName, NestedName, and NameType. Definition at line 194 of file ItaniumDemangle.h. References DEMANGLE_DUMP_METHOD, dump(), and ~Node(). Referenced by NestedName::getBaseName(), QualifiedName::getBaseName(), NameWithTemplateArgs::getBaseName(), and StdQualifiedName::getBaseName(). Definition at line 167 of file ItaniumDemangle.h. Referenced by ObjCProtoName::isObjCObject(), AbstractManglingParser< ManglingParser< Alloc >, Alloc >::parseCtorDtorName(), AbstractManglingParser< ManglingParser< Alloc >, Alloc >::parseTemplateArgs(), AbstractManglingParser< ManglingParser< Alloc >, Alloc >::parseTemplateParam(), BracedExpr::printLeft(), and BracedRangeExpr::printLeft(). Reimplemented in ForwardTemplateReference, and ParameterPack. Definition at line 175 of file ItaniumDemangle.h. Definition at line 155 of file ItaniumDemangle.h. References hasArraySlow(), Unknown, and Yes. Referenced by QualType::hasArraySlow(), ForwardTemplateReference::hasArraySlow(), PointerToMemberType::printLeft(), and PointerToMemberType::printRight(). Reimplemented in ForwardTemplateReference, ParameterPack, ArrayType, and QualType. Definition at line 170 of file ItaniumDemangle.h. Definition at line 161 of file ItaniumDemangle.h. References hasFunctionSlow(), Unknown, and Yes. Referenced by QualType::hasFunctionSlow(), ForwardTemplateReference::hasFunctionSlow(), PointerToMemberType::printLeft(), and PointerToMemberType::printRight(). Reimplemented in ForwardTemplateReference, ParameterPack, FunctionEncoding, FunctionType, and QualType. Definition at line 171 of file ItaniumDemangle.h. Definition at line 149 of file ItaniumDemangle.h. References hasRHSComponentSlow(), Unknown, and Yes. Referenced by QualType::hasRHSComponentSlow(), ReferenceType::hasRHSComponentSlow(), PointerToMemberType::hasRHSComponentSlow(), and ForwardTemplateReference::hasRHSComponentSlow(). Reimplemented in ForwardTemplateReference, ParameterPack, FunctionEncoding, FunctionType, ArrayType, PointerToMemberType, ReferenceType, PointerType, and QualType. Definition at line 169 of file ItaniumDemangle.h. Definition at line 179 of file ItaniumDemangle.h. References No, printLeft(), and printRight(). Referenced by llvm::ItaniumPartialDemangler::getFunctionDeclContextName(), ElaboratedTypeSpefType::printLeft(), ObjCProtoName::printLeft(), NoexceptSpec::printLeft(), FunctionEncoding::printLeft(), LiteralOperator::printLeft(), SpecialName::printLeft(), CtorVtableSpecialName::printLeft(), NestedName::printLeft(), LocalName::printLeft(), QualifiedName::printLeft(), VectorType::printLeft(), NameWithTemplateArgs::printLeft(), StdQualifiedName::printLeft(), BinaryExpr::printLeft(), ArraySubscriptExpr::printLeft(), PostfixExpr::printLeft(), ConditionalExpr::printLeft(), MemberExpr::printLeft(), EnclosingExpr::printLeft(), CallExpr::printLeft(), NewExpr::printLeft(), DeleteExpr::printLeft(), PrefixExpr::printLeft(), ConversionExpr::printLeft(), InitListExpr::printLeft(), BracedExpr::printLeft(), BracedRangeExpr::printLeft(), FoldExpr::printLeft(), ThrowExpr::printLeft(), IntegerCastExpr::printLeft(), ArrayType::printRight(), FunctionType::printRight(), FunctionEncoding::printRight(), and NodeArray::printWithComma(). Implemented in FloatLiteralImpl< Float >, IntegerLiteral, IntegerCastExpr, BoolExpr, ThrowExpr, FoldExpr, BracedRangeExpr, BracedExpr, InitListExpr, ConversionExpr, FunctionParam, PrefixExpr, DeleteExpr, NewExpr, CallExpr, SizeofParamPackExpr, CastExpr, EnclosingExpr, MemberExpr, ConditionalExpr, PostfixExpr, ArraySubscriptExpr, BinaryExpr, StructuredBindingName, ClosureTypeName, UnnamedTypeName, DtorName, CtorDtorName, SpecialSubstitution, ExpandedSpecialSubstitution, StdQualifiedName, GlobalQualifiedName, NameWithTemplateArgs, ForwardTemplateReference, TemplateArgs, ParameterPackExpansion, TemplateArgumentPack, ParameterPack, PixelVectorType, VectorType, QualifiedName, LocalName, NestedName, CtorVtableSpecialName, SpecialName, LiteralOperator, FunctionEncoding, DynamicExceptionSpec, NoexceptSpec, FunctionType, ArrayType, PointerToMemberType, ReferenceType, PointerType, ObjCProtoName, EnableIfAttr, AbiTagAttr, ElaboratedTypeSpefType, NameType, PostfixQualifiedType, ConversionOperatorType, QualType, VendorExtQualType, DotSuffix, and NodeArrayNode. Referenced by print(), QualType::printLeft(), AbiTagAttr::printLeft(), PointerToMemberType::printLeft(), ParameterPack::printLeft(), ForwardTemplateReference::printLeft(), DtorName::printLeft(), and CastExpr::printLeft(). Definition at line 192 of file ItaniumDemangle.h. Referenced by print(), QualType::printRight(), PointerToMemberType::printRight(), ParameterPack::printRight(), and ForwardTemplateReference::printRight(). Visit the most-derived object corresponding to this object. Calls F(P), where P is the node cast to the appropriate derived class. Definition at line 2000 of file ItaniumDemangle.h. References assert(), CASE, and FOR_EACH_NODE_KIND. This can affect how we format the output string. Definition at line 128 of file ItaniumDemangle.h. Track if this node is a (possibly qualified) function type. Definition at line 132 of file ItaniumDemangle.h. Tracks if this node has a component on its right side, in which case we need to call printRight. Definition at line 124 of file ItaniumDemangle.h.